Krishna is a local resident playing and coaching tennis in Clapham Common and district for over 25 years. He gained his professional PTR tennis coaching certification in 2005. 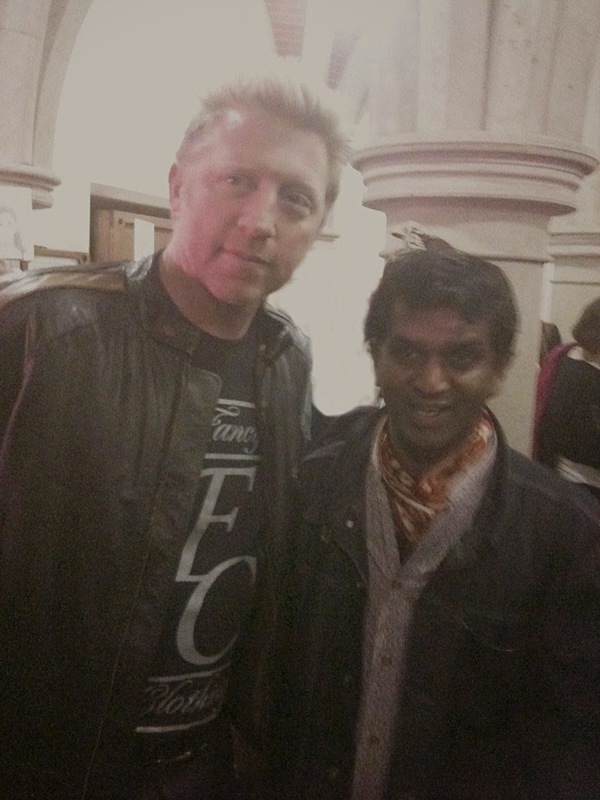 Among his tennis highlights are scholarship to Middlesex University High Level Tennis Centre while also undergraduate in Business Studies, and recent introduction at a fashion show to Boris Becker his teenage tennis idol (See picture below). Krishna welcomes players of all standards and age groups for private, pairs or group tennis. Where demand permits adult and junior social / fun drop-in tennis sessions are available. Mobile phone arrangement for such drop-in play. The above fees are all subject to discount as per block booking and other arrangements on first lesson. Tennis / Squash / Badminton Racquet Stringing: £15 basic nylon string or £20 for multifilment / polymer strings and other made-to-order strings. Krishna is enhanced CRB-checked with relevant PTR accreditation and public liability insurance. Also First-Aid certified. These are available on request and via Lambeth Borough Council's Lambeth Tennis Network. As per LineBall Tennis motto "Tennis is Our Pleasure…!" we aims for flexibility. So ALL booked lessons and cancellations will automatically be rescheduled. LineBall cannot guarantee court-costs for non-rain cancellations without at least 2 days notice to LineBall Tennis mobile contact.